Home Inspiration	Plan the Perfect Proposal with The Yes Girls! Plan the Perfect Proposal with The Yes Girls! I have such an exciting post today, and I can’t wait to share it with you…but first, speaking of sharing…Since most of our readers are either already engaged or married, and female…I am going to ask that you share this post with any of your friends, family members, co-workers, etc. that may be close to Popping the Question and you think may need a little help, cause who doesn’t when planning this crazy nerve-wracking special event?! But that’s where The Yes Girls come in! They are a team of creative marriage proposal, anniversary and wedding planning experts. The Yes Girls will assist you in making your customized and unique “She Said Yes” moment a flawless celebration! And I got to chat with Heather, the Yes Girls Owner, President, CEO and original proposal planner, and ask her a few questions! After all, one of the biggest days to get engaged is less than 2 weeks away! So, get ready for some tips on How to Plan the Perfect Proposal, learn a bit more about the Yes Girls, and check out some amazing real life proposals from The Yes Girls! How did you come up with the idea of The Yes Girls? I dreamed of starting my own wedding planning company when I was in high school. I know…probably scared off some high school boys with that one. It wasn’t until college through various internships that it dawned on me that men might want or could use a female’s perspective when it came to their proposal. When I graduated college, after some lofty research, I decided to pursue my passion and started The Yes Girls with desire to help men create personalized marriage proposal ideas and assist with any planning needed to make their vision come to life. How did your husband propose? Yes, I went personal, but I just had to ask! Kyle was in pilot training or the Air Force at the time. I flew out to Mississippi to visit Memorial weekend but from there we headed to Florida to visit some friends (or so I thought). For the sake of not blabbing on I will do a quick recap! Kyle planned a fun-filled weekend with beach time, jet skiing, and delicious food and when it came to the proposal he took me to a private area on the beach (we actually walked right by a wedding that was taking place) and after he proposed it was followed my favorite flowers, candles, dessert, champagne, and lots of photos. 🙂 Looking back, I feel like I totally should have seen it coming but I was truly surprised! If a guy is thinking about proposing what are the first steps they should take? I would recommend to start getting an idea of the engagement ring style she would like (many men go about this via her friends, mom, Pinterest, or going together). During that time, that’s when we encourage guys to begin their proposal planning process, and of course we recommend The Yes Girls. 🙂 This way while they are still in the process of getting the ring they are also budgeting and coming up with ideas for their personalized proposal. More often than not, once the ring is in the mens possession, they want to pop the question asap as if she can see right through them. Any tips for creating/pulling off the perfect proposal? Yes! Personalize the proposal to your relationship! This can easily be done by incorporating some of her favorite things such as her favorite flowers (from FiftyFlowers.com perhaps! ), photos together, inside jokes, etc. It’s smart to be budgeting for the ring and proposal because I haven’t met many (or rather any) women who would turn down a thoughtful and well planned out proposal. I use this analogy often, “You wouldn’t cook a five course meal and serve it on a paper plate.” Same idea applies for giving her that beautiful ring. 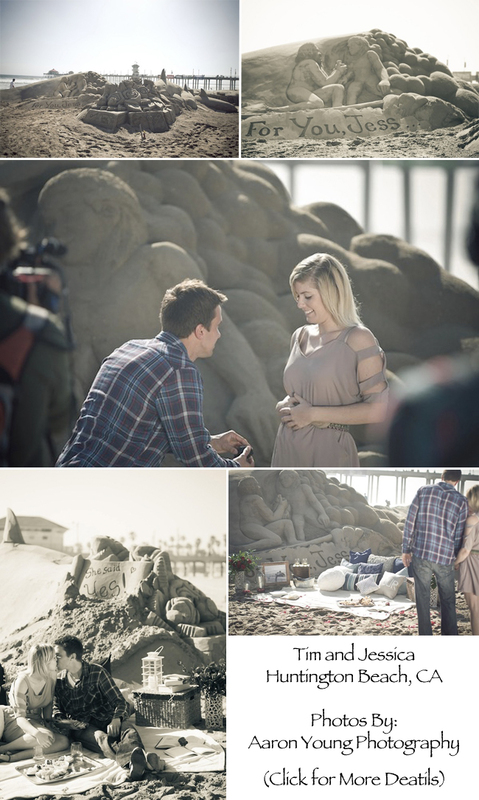 Do you have a favorite proposal that you have helped plan? I knew this would be a tough question, but again, just had to ask! 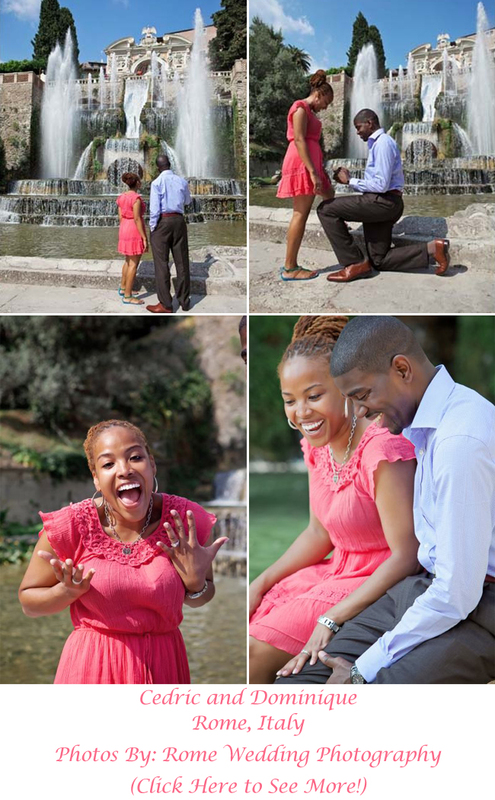 And speaking of some of those adorable couples…here are just a few, of the many, great proposals from The Yes Girls! Click on each one to see their full story! And here’s the proposal of an actual Yes Girl! I just LOVE her reaction! All of these lucky ladies got the proposal of their dreams, thanks to The Yes Girls! So, if you want to give your loved one a she said yes moment she will never forget, or if you just like reading all the happy engagements stories like I do, check out The Yes Girls! Remember, they also do Weddings, Anniversaries, and now, Date Nights!